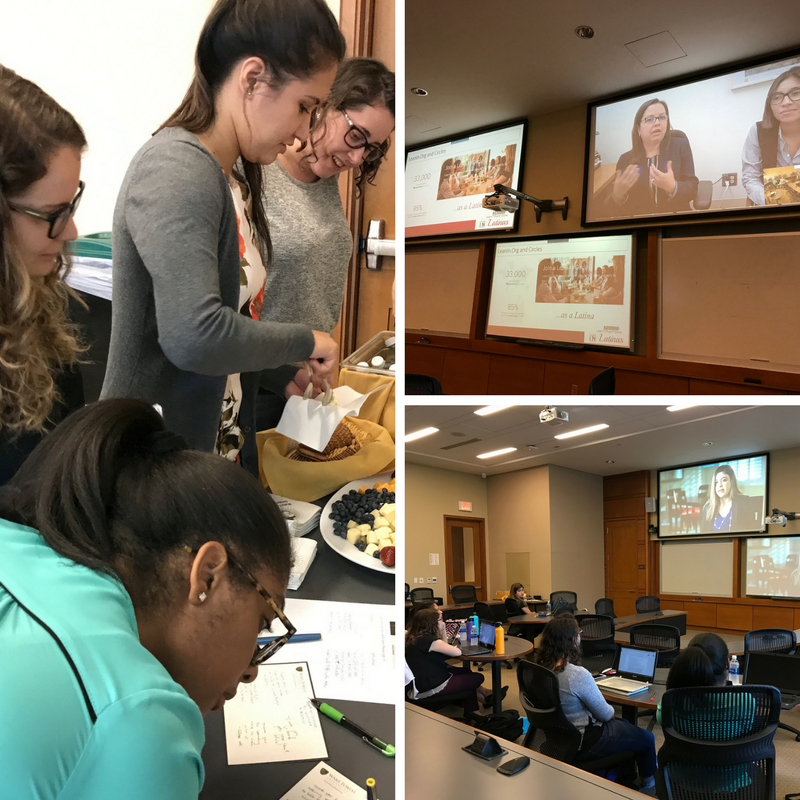 Wake Forest University School of Business hosted a real-time, virtual session with the founder of Lean in Latinas, Anna Dapelo-Garcia on September 21. A group of students gathered in Farrell Hall to participate in the interactive presentation and learn more about the Lean In Latina movement that has spread across the country in the past two years. Dapelo-Garcia, a healthcare administrator at Stanford Health Care as well as director of Lean In Latinas, spoke about her organization’s beginnings alongside Kim Jimenez, director of circle development. The two ladies spoke with Wake Forest students from Stanford, California. Lean In Latinas is a part of the greater Lean In movement, started by Sheryl Sandberg, Facebook’s chief operating officer. The Lean In movement revolves around small circles, which are groups of 5 people or more, to foster professional relationships and offer communities of support to women around the world. The group, whose motto is learn, share, grow, started when Dapelo-Garcia created her own Lean In circle called Lean In Latinas. Dapelo-Garcia shared member success stories and testimonials, as well as videos from Lean In Latinas retreats. The presentation concluded with a Q&A session, where students were given the opportunity to get advice and ask more questions about the organization’s story. Alexis Manley, a student in the Masters in Management program and president of Wake Graduate Women in Business, asked Dapelo-Garcia to share what she believes to be the most significant barrier to women in leadership. Manley said she enjoyed hearing from a perspective that she feels is often overlooked in the working world. “My favorite part of the talk was that we heard advice for all women, encouragement for us to go for what we want in a respectful manner,” Manley said.